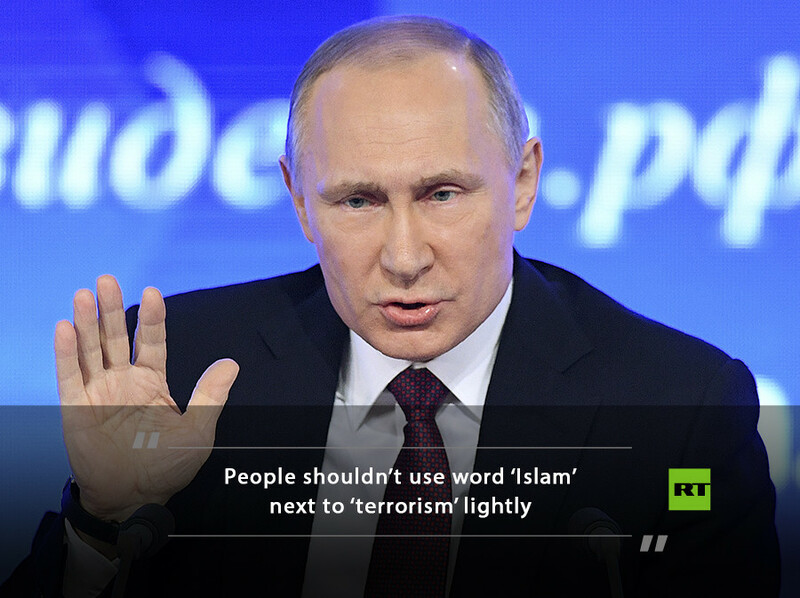 Allegations of personal involvement in the Democrats’ electoral defeats in the US, the threat of a nuclear arms race, and the potential for a Syria ceasefire – all of these were among the issues that came up at Russian President Vladimir Putin’s annual media conference. 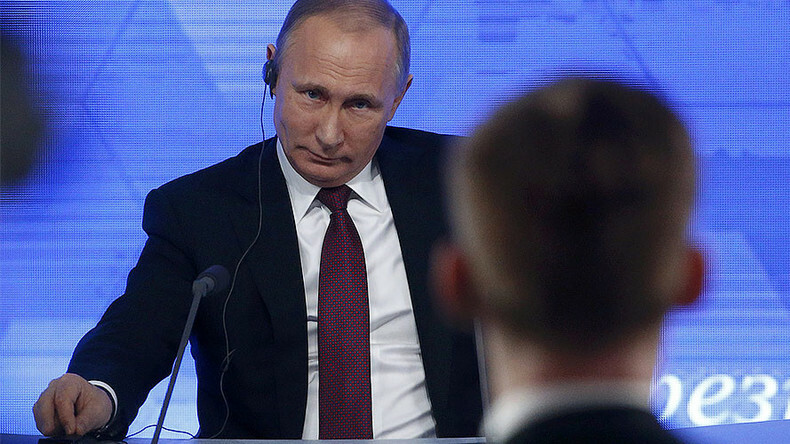 This year was Putin’s 15th question and answer session with journalists from Russia and leading international outlets. As in the past, it focused on domestic economic and political problems, but journalists also asked about Russia’s role in global affairs. 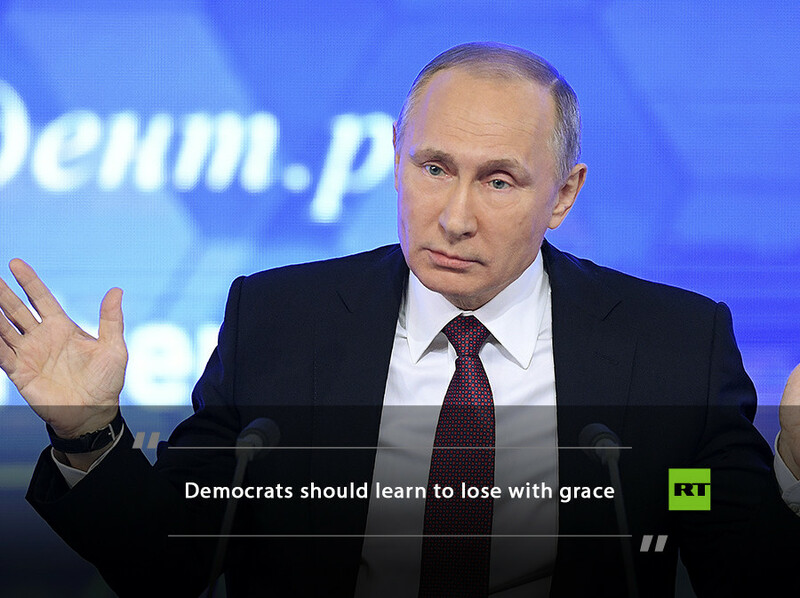 Putin reiterated his denial of interfering with the US presidential election, saying that the Democratic Party just wanted to blame all their failures on somebody else. He added that the party’s latest defeat came during the vote by the Electoral College this week. Two of the electors turned their back on Trump while five broke the Democrat ranks and refused to vote for Clinton. “They are losing on all fronts and look for someone else to blame. I believe, this is, how should I say, humiliating. One should know how to lose with grace,” he said. 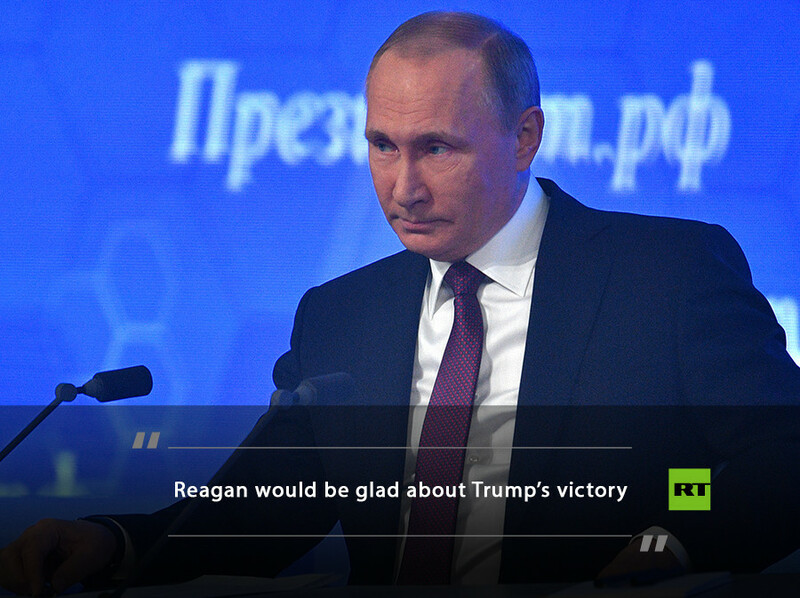 Putin rejected the notion that the rising support of Russia among Republican voters was due to his personal appeal to them. “I believe that means that a significant part of the American people has a viewpoint coinciding [with Russia’s] on how the world should work, what we should be doing and where common threats and problems are,” he said, adding this could be the foundation for good relations between the US and Russia. Putin said Russia was forced to improve its nuclear weapons after the US pulled out of the Anti-Ballistic Missile (ABM) Treaty in 2002. Therefore, if the two countries were in a nuclear arms race, it was initiated by Washington, Putin said. “When one party unilaterally withdrew from the treaty and said it was going to create an anti-nuclear umbrella, the other party has to either create a similar umbrella – the necessity of which we are not sure about, considering its questionable efficiency – or create effective ways to overcome this anti-ballistic missile system and improve its strike capabilities,” the Russian president told journalists. He added that the US too was upgrading its nuclear arsenal, including tactical nuclear weapons deployed in Europe. 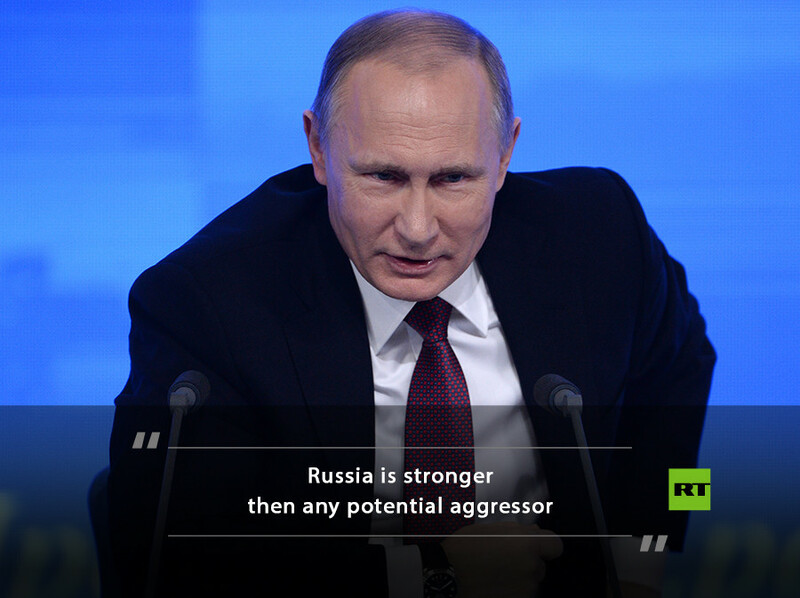 #Putin in response to my question: U.S. election system is archaic. In general next time let's see what lessons have been learned. “We organized it and moved people in thousands and tens of thousands. Not only the armed radicals and their supporters, but also women and children,” he said. Putin added that the interests of other regional powers, such as Saudi Arabia, Jordan and Egypt, as well as the opinion of America, were all taken into consideration. The next goal in Syria is a nationwide ceasefire and political settlement, the Russian leader said, adding that Moscow had suggested that Kazakhstan hosts peace talks on the matter. Putin said that the assassination of the Russian ambassador in Turkey this week made him reconsider the theory that the shooting-down of a Russian warplane by a Turkish fighter jet last year could have happened without an order from the Turkish leadership. “Frankly speaking, I was skeptical about this [theory]. But now, after the attack on the ambassador committed by an officer of the special service, I began to reconsider. I may believe now that anything is possible,” he said. The downing of the Russian plane over Syria sent Russian-Turkish relations into a tailspin. Months of diplomatic work were necessary to close the rift and bring Ankara and Moscow on better terms. The situation in Turkey changed dramatically after a failed military coup in July. Ankara accused self-exiled cleric Fethullah Gulen of masterminding the coup and launched a crackdown on his alleged supporters embedded in Turkey. Some officials said that the downing of the Russian plane in November 2015 was inspired by the movement and was intended to make Russia an enemy of Turkey and its government. Normandy process inefficient for Ukraine crisis, but what’s the alternative? The lack of progress concerning a Ukrainian peace settlement under the so-called ‘Normandy format’ is regrettable, but there is no better alternative at the moment, Putin said. He was referring to the regular meetings of the leaders of Ukraine, Russia, Germany and France, meant to deescalate violence in eastern Ukraine. The most recent gathering of the group took place in October.